The Edgewood Yacht Club Sunfish fleet begins its 2011-2012 season of Frostbite racing on Sunday, November 6. Full sailing information, scoring and highlights from each day's racing is available below. If you have questions, ideas, or even need help assembling your own Sunfish rig to join in the competition just send email to FrozenFew@edgewoodsailing.org and we'll see what we can do. 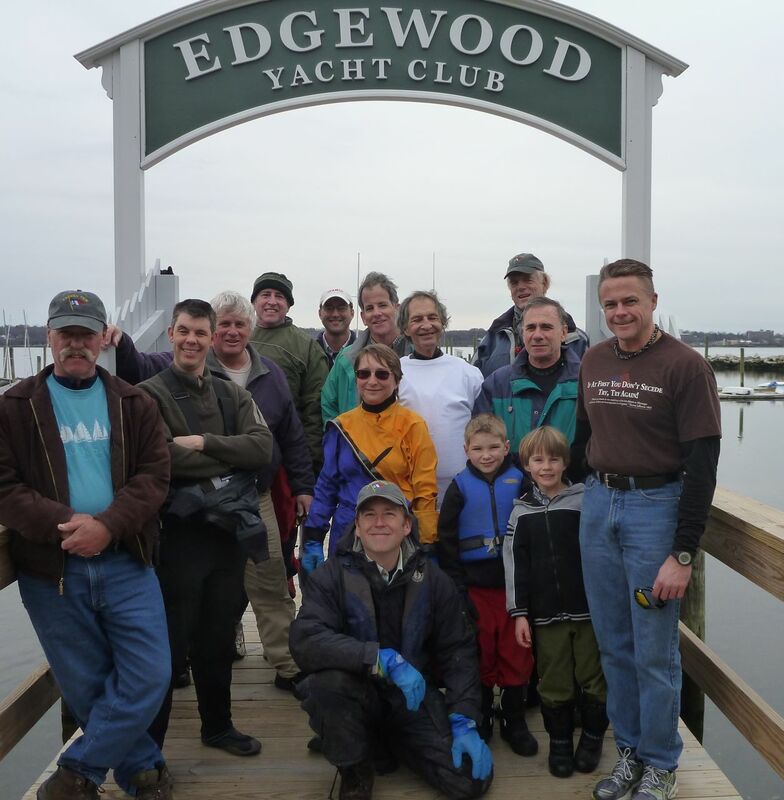 The Frozen Few from Edgewood extended their season to include an open invitation to all the other frostbite racers around the Bay for the jointly sponsored NBYA/Edgewood "FRAC" regatta, for Frostbite Racing in All Classes. We hope that all of our Edgewood Sunfish skippers will be able to attend the 2012 NBYA Frostbite Regatta All Classes (FRAC). This will be the last day of frostbite racing this season, and will allow us to make up one of the days we missed in the spring series due to weather. First warning whistle will be at 11 am. Edgewood has revived the Narragansett Bay Frostbite open regatta, and will host this year's event Sunday March 4. It was a busy day for the Race Committee as Sunfish toppled over in strong gusty breeze from the NorthWest on Sunday. Wind was around 10 knots during the lulls and about 20 knots during the gusts. The safety boat left the line four times to assist capsized sailors. Temperatures were mild, at 40 degrees and 30 degree wild chill. Dave S finished first for the day, with Catherine one point behind in second place. Bill S. took third for the day.